On Tuesday the 11th of December, 2018, the Ground Truth 2.0 consortium visited the citizen observatory of the Dutch demo case: Grip op water Altena. The objective of Grip op water Altena is to reduce the damage caused by pluvial flooding. 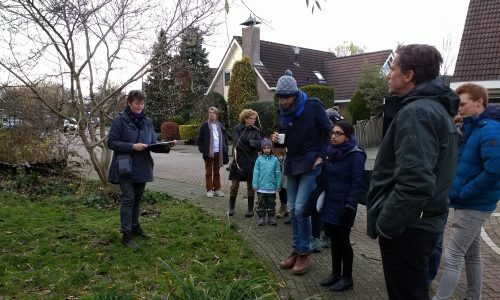 The observatory core group showed the project partners that measures against pluvial flooding are being taken from the small scale of private gardens to the large scale of water storage basins. The Ground Truth 2.0 plenary meetings are held every six months in one of the project’s demo case countries, to facilitate a visit to the corresponding citizen observatory. The plenary meeting in Belgium in November 2017 was combined with meeting the citizen observatory Meet Mee Mechelen, the Maasai Mara Observatory was visited during the meeting in Kenya in May 2018. 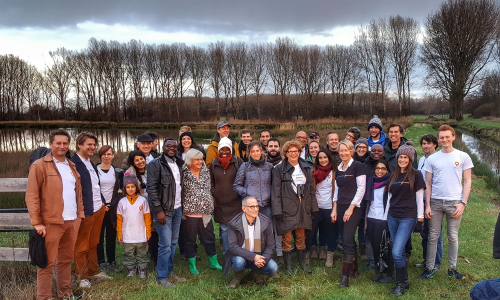 The most recent plenary meeting was held from 10 to 12 December at IHE Delft in the Netherlands, including a visit to the Dutch citizen observatory Grip op water Altena. Apart from the project partners, four active participants of the Belgian observatory Meet Mee Mechelen came to Altena. They were welcomed by three members of Grip op water Altena, who guided them through the nature and water storage area Kornse Boezem in Dussen before the consortium arrived. The combined group of about forty people started their visit in the city of Woudrichem. In two groups, they went to see a small natural garden that has been designed to store the water of a heavy rain shower, relieving the sewage system. The designer of the garden explained which measures have been taken to keep the water in the garden. The other half of the group were informed about the pluvial flooding that occurred in the area in the summers of 2014 and 2015 and the measures that have been taken since. This news item was written by Rianne Giessen who is part of the Ground Truth 2.0 team and works for HydroLogic Research (HR) in Delft.